The upcoming Gears of War 3 will support stereoscopic 3D, but at a slight cost in visual quality. 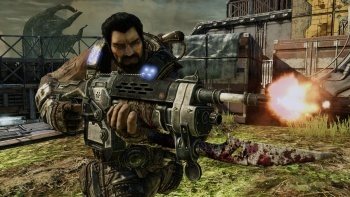 Microsoft may not have quite the same level of commitment to 3D gaming as Sony does with its PlayStation 3 but the technology is there and when the question of whether or not to put it to use in the upcoming Gears of War 3 came up, the answer, according to Fergusson, was quite simply, why not? "It felt like something we wanted to have. It was a feature we didn't want to be deficient in. When you look at Gears 1, it was what people used to demo HD at the time," he told Eurogamer. "It's still fledgling technology. It's still a niche feature. But it was something we could support, so we felt, why not?" Unlike the PS3, which outputs in full HDMI 1.4 stereoscopic 3D in the 1280x1470 framebuffer configuration, the 360 puts two distinct images into one 720p framebuffer. I have no idea what any of that gobbledegook nonsense means but the upshot is that the image quality in 3D will be slightly lower than in 2D. Fergusson described it as "a little big jaggier" in areas, saying, "Instead of 720p you're at five something." "It's great. I love the qualities it provides, the window into a world. That's what the 3D gives you," he continued. "Having that depth of character, and being able to see that separation from the reticule and the creatures in the background - it's a different experience but it's a really good one." Gears of War 3 - or, perhaps, Gears of War 3D - comes out on September 20, exclusively for the Xbox 360.